A one month break from all things Duh. 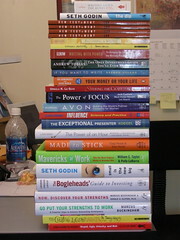 This whole stack of books will be travelling with me soon. And I only bought one of them, the others belong to my book-hunter brother. About two weeks ago, a group of us, desperate doc students, brought up the issue of our stagnanted stipend to the faculty. I’ve never felt such unity and determination among our group. We came together and worked on a letter and a table of hard data, and submitted it to the chair of the department. Then the day came for our research forum where we met with the faculty. We were anxious to hear their responses, but when my own beloved advisor strongly stated that the stipend was not meant to cover all our living expenses and that we should find our own additional sources of funding (e.g., family, loan), that basically shot down all our hopes. So we left the meeting, a little crushed but life goes on. Today, my advisor brought in my 2007/2008 funding letter, I needed to sign it before I leave so that I’ll get paid in the summer. However, in the letter was an unexpected surprise…I got a $100 raise!! It feels good that our concerns were not brushed aside. It feels even better that our efforts were not in vain. Matt: Is this your first time hiking today? Matt: What about you, Ailsa? Amy: Have you done it before? Lastly, the group, minus Matt, the photographer. 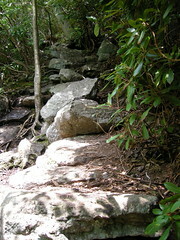 This was one of the easier sections. Some sections were steep and sandy with nothing to grab on to. 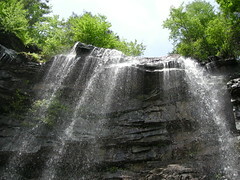 One of the many waterfalls at Glen Onoko. I brought along Victor’s new Nikon coolpix p5000 10MP camera, and I have to say the pictures turned out so much nicer than my old 3.2MP camera. 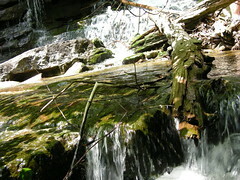 But while I was maneuvering the treacherous trail, taking photos was the last thing on mind. And at the same time, I had to take special care not to smash up the camera. The camera made it through the ordeal unscathed. One last adventure before heading home. 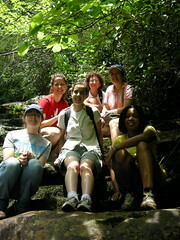 I went hiking with a small group of women from my bible study to Glen Onoko Falls. 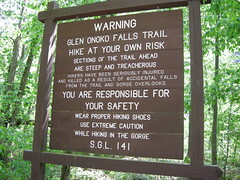 I only saw this sign at the end of the trip, so I wasn’t properly warned! Some parts were steep, some parts were sandy and rocky, but all of us made it back safely..no injuries, minor or major, just a little dirty. Now that I’ve read and wrote about the accomplishments of others – what about me? What do I hope to accomplish? 1. A portfolio of my reflections of special education, especially in the Malaysian context. It is also something that I hope will reflect my values, knowledge, and application ideas. And I plan to use it when it’s time for me to interview for jobs. 2. A resource site for parents, teachers, and anyone else who is interested. To do this, I need to revamp the site and include teaching strategies with concrete examples, and also include layman definitions of all the academic and special education law words. But at the same time, I don’t want that blog to become one of those all-facts-no-life site. I think the trick is to make the content accessible and relate-able to everyone. So, that’s what I hope to accomplish in June! Nah….Victor says it takes two years to establish a blog. I hope to add two updates per week in June, and start the ball rolling from there. 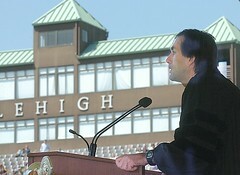 When I first came across the name of this year’s commencement speaker – Erik Weihenmayer – in the commencement schedule, I was like, “Erik, who?” So, I skipped his speech and other speeches, and only attended the last hour of the commencement. While the names of the many graduates were being called out, I was browsing through the commencement book and then found out that Erik Weihenmayer is the blind man who climbed to the top of Mount Everest!! Now, I regret not being there earlier. He is the only blind person to have climbed the “Seven Summits,” the tallest peak on every continent. Talk about raw guts and determination. Since I wasn’t there, I can only rely on the local newspaper for quotes from his speech. To climb, Weihenmayer must reach out and find a crevice or something on the mountain face to grab hold of, not unlike what people do every day to move forward. ”The reality is that we’re always reaching out into darkness,” he said. But many people don’t keep moving out of fear of failure. As graduates, you will be entering a world of tremendous uncertainty and tremendous adversity, with wars, with overpopulation, with climate change, with disease, with hunger, with a clash of cultures and ideas, Weihenmayer said. It’s a chaotic world and it’s harder and harder to predict the future. Quite often, I think you’ll feel like you’re climbing blind. I think this is the best time in history, the most precious time in history to be a pioneer, to reach out, to seize hold of adversity and the challenges we face, to harness the energy not only to transform our own lives, but to elevate the world around us. Besides Weihenmayer, other quotes that caught my eye were from Patrick Belmont, the former treasurer of the Graduate Student Senate, who spoke on behalf of graduate school grads. Go do great things and do them with passion. Undo those things that are wrong in the world. Act. Indifference is our biggest obstacle to progress. This guy, together with a few other students, took on Lehigh’s administration to eliminate the $150 technology fee that graduate students have to pay every semester. They didn’t manage to eliminate it totally, but they got the administration to reduce it by half, which is remarkable. For a long time, graduate students have been complaining about the technology fee, but at last someone acted and persisted through the many no-s that came his way. Lastly, I have to write about Hidayah. She’s a fulbright scholar from Singapore. While, she was at NUS, she took a year of French, and then she went on a one-year exchange program to Paris. For a whole year, she was taught by world-reknowned people and studied everything in French. When she told us about her experience during the BBQ, we were in awe of her accomplishment. But she went on to tell us the price she had to pay for that. She said that every night while she was studying (with a dictionary by her side), she would be crying. As if college-level materials were not hard enough, she had to learn it in French! I cannot imagine how difficult it must have been for her. And I cannot imagine putting myself in her situation.